Centrifugal Mist Collectors were originally developed for use on the gear boxes of nuclear submarines. This has become the most popular system for coolant mist collection. In operation, the rotating filter element coalesces the captured mist back into droplets. 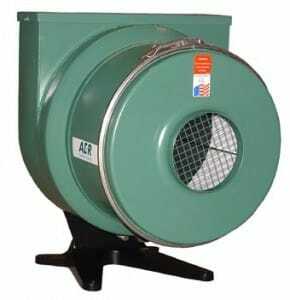 Centrifugal force then throws the droplets free of the perforated drum to the inner wall of the casing. High velocity air drives the liquefied oil along the walls through a circumferential slot, and out through the forced-air drain. Clean air returns to the plant environment by way of the exhaust grill, and the clean, recycled oil drains from the unit for re-use or disposal. The fact that the system does not rely on gravity for drainage allows it to run continuously, 24 hours a day, without requiring a shutdown. 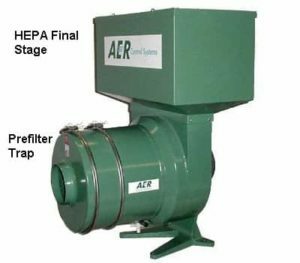 Prefilter trap– This is mandatory on any centrifugal mist collector and eliminates any chance of vibration caused by ingestion of chips or large items. Worth its weight in gold! HEPA Final Stage– Although the primary section of the centrifugal system is over 98% efficient at 1 micron, it will still pass a small amount of smoke if enough is present. The HEPA eliminates this and is 99.97 % efficient at 0.3 microns (the average size of an oil smoke droplet). Because the primary section is so efficient, our HEPA‘s typically last over 1 year. Competitive HEPA‘s will last only a few months under equal conditions. Pedestal – Mist collectors have been directly machine mounted for years, but we actually prefer to mount the system on a pedestal. This eliminates even the slightest chance of vibration being transmitted to your machine and allows for safe access during periodic maintenance. Flex Hose, collars, clamps– Wynn Environmental stocks a wide assortment of installation accessories, including premium quality clear urethane flex hose. This stuff lasts! Installation Service– We have been installing these systems for over 25 years and perform reliable, efficient work. We’ll be finished and cleaned up before you know it. Experience is the key!